Mariners Latest: Viva La Vargas! 6 to Nothing Shutout!!! Viva La Vargas! 6 to Nothing Shutout!!! 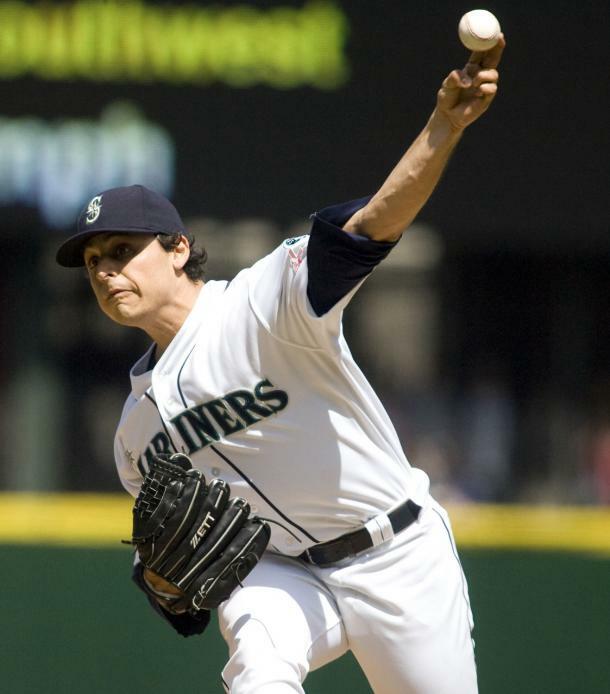 The Mariners had one of their best games of the season in a 6 - 0 shutout of the San Diego Padres. Jason Vargas was exceptionally good tonight, not allowing a runner into scoring position all night until the ninth inning when Chase Headley advanced to second base on indifference. He allowed only six singles while striking out seven in nine complete innings. The offense did their part tonight and helped Vargas get his 6th win of the season. They started early too, as Brendan Ryan doubled in the first and Adam Kennedy singled him home. Mariners 1, Padres 0. The third inning the Mariners made things interesting. After Figgins reached base on an error, Ichiro followed by hitting into a fielders choice. Brendan Ryan singled to right field sending Ichiro to third base but Ryan was quickly removed from first after trying to advance on a passed ball. The ball didn't get too far passed the catcher so Ryan tried to go back to first and was thrown out by Nick Hundley. With two outs, Adam Kennedy walked on a full count, Justin Smoak walked on a full count, and with the bases loaded, Jack Cust walked. With the bases loaded walk to Cust he now holds the single season record for a Mariner with 6 bases loaded walks this year and we are just halfway through the season. Ichiro came in to score on the play. Carlos Peguero followed Cust with a two RBI hit into center, scoring Adam Kennedy and Justin Smoak. Mariners 4, Padres 0. The fifth inning Justin Smoak hit a double to break an 0 for 22 slump as he was followed by Jack Cust who hit him home with a double of his own. Mariner 5, Padres 0. Brendan Ryan received a one out walk in the seventh inning and stole second base. Kennedy hit a double into right field as Brendan Ryan scored and that put the Mariners up 6 to 0. A collective nine hits for the M's, some good two out rallies, excellent hitting with runners in scoring position and as per usual, great starting pitching. The Rangers stomped the Marlins 15 to 5 tonight and the Angels are currently losing to the Dodgers 5 to 0 in the 8th. We'll gain no ground on first place, but may gain ground on the Angels again. The Oakland A's pulled out a 5 to 4 win over the Diamondbacks. If we can keep putting together offensive nights like tonight, this is a team I can rely on to do something this year. We'll try it again tomorrow with Doug Fister on the mound.